About Us | EZ-FLO International, Inc.
EZ-FLO® International, Inc. was founded in 1979. As our name indicates, we are a global company with distribution in the U.S., Canada, Mexico, the Caribbean Islands as well as Central and South America. Based in Ontario, California, EZ-FLO operates in Rockwall, Texas and has distribution centers in New Jersey, North Carolina, Florida, Texas and California. We also operate a wholly-owned manufacturing facility in Ningbo, China. 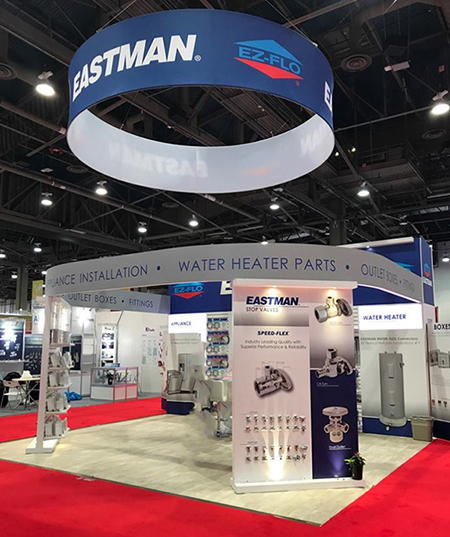 For more than 50 years, our Eastman brand products have been synonymous with premium quality appliance and plumbing connectors trusted by generations of professional installers, plumbers and consumers. Over the years, we have expanded our product lines to include pans, outlet boxes, expansion tanks, and more. Today, every product manufactured by EZ-FLO Eastman carries a long history of quality and innovation. By owning and operating our own state-of-the-art manufacturing, we are able to assure that the highest quality standards are met for each product. With extensive experience in designing, engineering, and manufacturing quality plumbing products we are committed to exceeding the highest level of quality standards of manufacturing. We carry deep inventories in our ﬁve distribution locations, which allow our customers to buy just in time, right when you need it, resulting in lower inventories, increased turns, and higher proﬁtability. When you stock EZ-FLO & Eastman products, you can be conﬁdent you are getting the most reliable installation parts that are Made Right and Made to Last.